Some comic book story elements are so iconic that they've made the leap into pop culture. These infamous tidbits range from the death of Batman's parents to the power of Superman's glasses to completely shroud his identity. Likewise, the notion that Aquaman is useless has rippled out all over the world. But those who've enjoyed a joke at the expense of the Justice League's soggiest member may be surprised to discover that the King of the Seas, Arthur Curry, has received a spin-off book: Aquaman and the Others. As the title suggests, the book focuses on Aquaman and his past partners, all of whom wield Atlantean artifacts that grant them powers. I gave this book the benefit of the doubt, as many of the New 52's best books have been the ones you'd least expect. After a single issue, however, Aquaman and the Others sinks far more than it swims. The issue opens with a full-page advertisement that's eighty percent abs and ten percent Arrow logo, with an actor taking up what's left over on the page. It's a bold way to open. 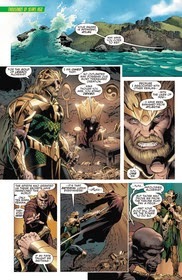 After that, the story begins with a flashback to "thousands of years ago," in which the usurped Atlantean king Atlan stabs an alchemist who's trying to stop him from taking the final ten bars of "gold of legacy"—which may be the most underwhelming name since the Matrix of Leadership from Transformers: Revenge of the Fallen. As the alchemist bleeds out, Atlan teases that the gold will give him the power he needs to retake his throne. After the two misfires, we finally get to see one artifact work as Sky Alchesay, a young Native American girl who is the recent recipient of the Seal of Clarity, uses the Seal to fend off another group of attackers (dressed similarly to the previous groups) by taking her assailants into the Ghost Lands. There, they confess to a master plan to collect all seven Atlantean artifacts. Elsewhere, Aquaman assists the Operative when the latter's—wait for it—operation goes south because the Atlantean Key fails to work. As Aquaman and the Operative round up the rest of the Others in the Operative's mobile command center, the Living Room, we jump to a villainous plot in Trezygstan, where the orchestrator of the previous attacks makes plans to use more firepower next time. The Living Room is shot down, but before we can see how the Others fare, the story jumps to Iran. 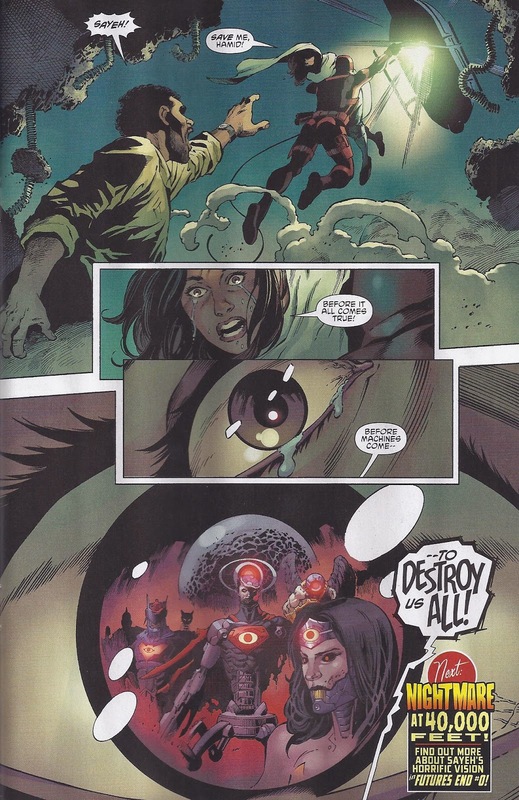 There, Sayeh—the previous wielder of the Seal of Clarity—is taken prisoner by the previously-seen assailants, though not before she can wrap up the issue with a vision of events from the upcoming DC limited series Futures End. All in all, this was a pretty standard introductory issue. It made a fairly simple inciting incident (the artifacts not working) last an entire issue. I'm always supportive of new readers to comics, but issues like this baffle me as they underserve longtime comics readers. It seems counterintuitive to spend so much precious page space introducing us to a cast of B-list characters. One line of dialogue can explain what their powers do, showing us that they aren't working correctly. Dedicating an entire issue to driving this notion home seems excessive. Although the tease at the end was interesting, the issue didn't wholly succeed at establishing an exciting world for these characters to play in. What did you think of the return of the Others? Are you looking forward to Futures End? Let us know in the comments section below!